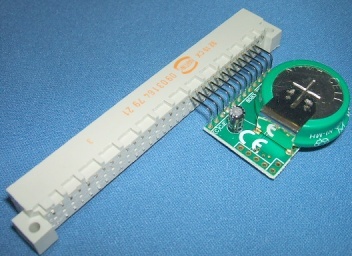 CJE Micro's : Products : Replacement Clock module for: RiscPC & A5000 etc. Replacement Clock module for: RiscPC & A5000 etc. Failing Real Time Clocks (RTCs) and CMOS memory is a big problem for many earlier Acorn computers. Leaking batteries can cause extensive damage, but when the damage is limited to affecting the clock1 then our module can provide the solution. Many people, like ourselves, have put their RiscPCs etc. into storage, removing the battery first to avoid any leaks, unfortunately it has been found that if no battery is connected for several months the clock may fail to start again when a new battery is fitted (there is a software fix for a 'stalled' clock but this only works in a very few cases for clocks failed this way). Whilst fitting the Clock Podule/miniPodule is very simple (no soldering required) you may have to disable the old clock. This can be easily done by cutting the appropriate legs on the existing clock chip. Despite the chip being surface mounted this is not as difficult as it sounds, provided a suitably fine pair of side cutters are used (we can supply a suitable pair if necessary) and we plan to show how easy it is to do at the next few RISC OS shows by letting customers do it on our stand. A prototype of this design has successfully worked for over three years! If all the podule slots are in use on your RiscPC or A5000 we can supply a two or four slot RiscPC backplane or an A5000 backplane with a module attached. 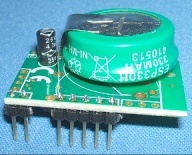 The remote battery plugs onto either two pins of the three-pin header with the coloured wire (battery +ve) on the middle pin. Availability: Available now from stock! * The A7000 & A7000+ have significant limitations regarding fitting upgrades, and users should contact us for advice.